Funeral Services – with or without religion? "Your friendly, polite and professional service at a very difficult time for my family and I was so appreciated. You have all gone above and beyond and I can't express just how grateful I am." "I really can't convey how wonderful you were at what was a very difficult time for my sister and I. Nothing was too much trouble and you took care of everything for us." "Your craftsmen created something so personal for us – a lasting tribute to someone so special." "Your staff’s professional and friendly service throughout this difficult time is something that will always be appreciated and remembered." "Your staff showed sensitivity, unfailing support and utmost dignity and respect." "We actually looked around for the best place and the best price for what suited us. Once we had seen you, we knew that we were in the best of hands." "Thank you for your care, kindness and excellent funeral arrangements." "From the very first phone call, I felt an empathy, warmth and understanding and I could not have wished for a better person to guide me through everything." Situated in the centre of the village, our Caister office provides a welcome and comforting environment to our families. 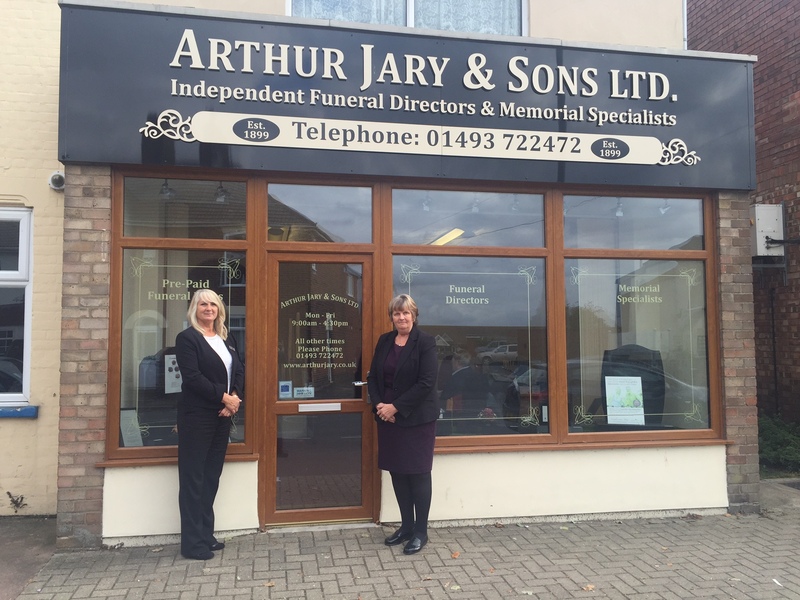 Maggie and Donna are experienced funeral arrangers, who will be able to help with funeral plans and any initial memorial inquiries. The office has its own private Chapel of Rest, which is available for families to use should they wish to visit their loved ones whilst in our care. There is a small selection of memorials on display, or please visit the showroom on Northgate Street in Great Yarmouth if you wish to speak to the stonemason or see the much larger selection. For those who are less mobile, or prefer the comfort of their own home, we are pleased to offer a home visit for funeral arrangements, funeral planning, and memorials. Arthur Jary & Sons Ltd.